Amsterdam, the Netherlands – March 1st, 2017. 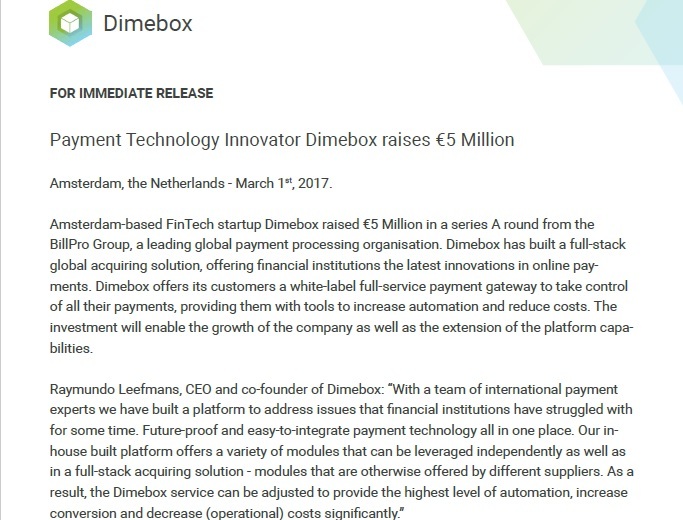 Amsterdam-based FinTech startup Dimebox raised €5 Million in a series A round from the BillPro Group, a leading global payment processing organisation. Dimebox has built a full-stack global acquiring solution, offering financial institutions the latest innovations in online payments. Dimebox offers its customers a white-label full service payment gateway to take control of all their payments, providing them with tools to increase automation and reduce costs. The investment will enable the growth of the company as well as the extension of the platform capabilities. Headquartered in Amsterdam, Dimebox is an innovative payment technology provider, founded by key experts with years of experience in the CNP Payments industry; expertise which enabled them to develop a full stack acquiring solution. Dimebox offers PSP’s, acquirers, e-commerce platforms and APM’s a smart payment intelligence platform. The modular, white label SaaS solution includes fully integrated risk management, A.I. based fraud protection tooling, chargeback automation and billing and settlement capabilities, enriched with smart data analytics, machine learning and business intelligence features. The result is a powerful end to end processing solution enabling real-time decision making throughout the entire payments value chain.